The sky at 10 p.m. local time this week from mid-northern latitudes. Inset depicts what the ancients saw. Last month, I pointed out my two favorite double stars of the summer sky. This, week, I thought I'd highlight two of my favorite summer deep-sky objects. Both are well placed for viewing as soon as the sky gets sufficiently dark. While binoculars will reveal both objects as mere fuzzy patches of light, both evolve into splendid sights through a good telescope. And of course, to truly appreciate them, you should really try to get to a location with a minimum of light pollution, which will also allow you to appreciate the beautiful summer Milky Way. About halfway up in the southeast sky as darkness falls, are several clouds of stars that are surrounded by a few dark regions in the bright area of the Milky Way halfway between the star Altair and the teapot-shaped pattern of Sagittarius. Four faint stars in a stretched-out diamond are about all that is visible of Scutum, the Shield. The Shield was described as a constellation by Hevelius, a 17th century astronomer, who christened it with the fantastic moniker: Scutum Sobiesciarium in honor of John Sobieski, a Polish king who defeated the Turks at Vienna in 1683. This constellation still exists today, although known simply as Scutum. And one of the Milky Way's great star clouds is also within Scutum. Near the northern star of the Shield is the 11th entry in Charles Messier's famous catalogue of "fuzzy" objects masquerading as comets. Messier 11 is one of the richest and most compact of galactic clusters, described by one experienced observer as resembling "a flight of wild ducks." In his definitive "Celestial Handbook," Robert Burnham, Jr. (1931-1993) wrote: "In binoculars or a low-power telescope it at first resembles a globular (cluster). But with increasing magnification the stars draw apart, finally revealing M11 as a rich swarm of glittering star points, somewhat triangular in shape with one brighter star near the center, but no real central nucleus." Deep-sky authority Walter Scott Houston (1912-1993), who had a regular column in Sky & Telescope magazine for nearly half a century noted that in his 10-inch reflector, M11 resembled, " . . . a carpet of sparkling suns to the very center with outliers swarming on all sides." 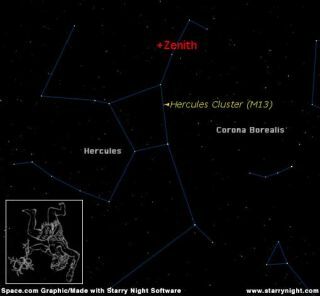 Quite possibly the most celebrated object in the summertime skies is the Great Cluster in Hercules, known also as M13. If you have ever visited the annual summer gathering of amateur astronomers near Springfield, Vermont known as Stellafane (http://www.stellafane.com/), you know that this famous cluster is often on display in the observatory that houses the famed Porter turret telescope. This week, the Great Cluster is located nearly overhead as darkness falls. To locate it, look toward the four stars, known as the "Keystone" which supposedly forms the body of Hercules. As anyone from Pennsylvania can tell you, a keystone is the stone atop an arch, and has this kind of shape, narrower at one end. It's between the two western stars of the Keystone that we can find the Great Globular Cluster of Hercules. It's about a third of the way along a line drawn from the stars Eta to Zeta. Actually, it was not Messier, but Sir Edmund Halley (of comet fame), who first mentioned it in 1715, having discovered it the previous year: "This is but a little Patch," he wrote, "but it shows itself to the naked Eye, when the Sky is serene and the Moon absent." Located at a distance of about 25,000 light years, the Hercules Cluster has been estimated to be a ball of tens of thousands of stars roughly 160 light years in diameter. Messier first saw the cluster in June 1764 and described it as a "round and brilliant nebula with a brighter center, which I am sure contains no stars." (Obviously, he must have been using an inferior telescope). Today, if you use good binoculars and look toward that spot in the sky where M13 is, you likely will see a view similar to Messier's: a roundish glow or patch of light. Moving up to a telescope, the view should dramatically improve. With a 4 to 6-inch telescope, the "patch" starts to become resolved into hundreds of tiny pinpoints of light. ". . . an incredibly wonderful sight; the vast swarm of thousands of glittering stars, when seen for the first time or the hundredth, is an absolutely amazing spectacle." Truly a grand cosmic chrysanthemum!